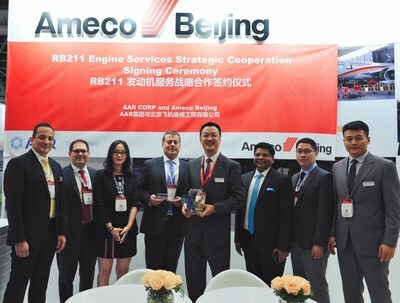 SINGAPORE, Nov. 8, 2018 /PRNewswire/ -- AAR (NYSE: AIR), a global provider of aftermarket aviation services for commercial airlines, signed a long-term contract with Ameco, a world MRO expert in RB211 repair and disassembly on Wednesday at MRO APAC. The deal positions AAR to provide long-term support to customers in the market for this Rolls-Royce engine. Daniela Pietsch, Vice President Corporate Marketing & Communications, at editor@aarcorp.com or +1 630-227-5100.; Yan Li, Manager of Communication and Culture, Ameco Beijing, at yanli@ameco.com.cn or +86 87492387.